AAI (Airports Authority of India) invites Govt job applications from the qualified applicants who have the domicile of the following states: “West Bengal, Bihar, Odisha, Chattisgarh, Jharkhand, Andaman & Nicobar and Sikkim”. All Applicants who belongs from one of these states can apply for these posts of Junior Assistant at various airports in the above States in Eastern Region. Domicile Certificate issued from the O/o The District Magistrate to be uploaded along with the Application Form. 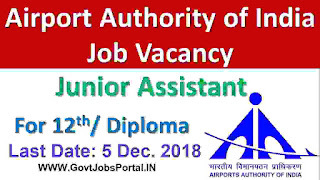 All the eligible applicants shall apply online through Airports Authority of India official Website i.e., http://www.aai.aero--- >Careers for the above post. More information related to this AAI Recruitment process for Jr. Assistant posts is given below in this article. Read the whole article carefully before applying online. Education: 10th pass candidates from recognized educational board and after that completed 3 years diploma in one of the following stream: “Mechanical/Automobile/ Fire”, can apply for these AAI Jobs 2018. Applicants should have score 50% marks in diploma course. Those who have passed in 12th class from a well known educational board of India on regular basis and score 50% marks in 12th examination can also apply. Age Bond: The minimum age of the applicant must be 18 years and the maximum age criteria is 30 years. Those who lies in between this age criteria can apply for this AAI Recruitment process 2018. How Much Application Fee to be paid for applying? 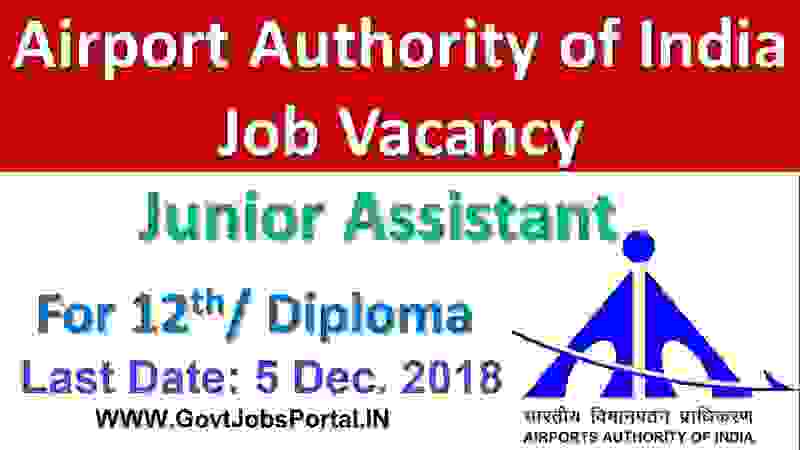 Those who are interested in these Government jobs under Airport Authority of India department have to apply online through the official website of the department. The link for applying online for these AAI Jobs will be activated on 5th Nov. 2018 and this link will remain activated up to 5th DEC. 2018. So all the candidates have to apply online between these dates. There is no other second way for applying these Government jobs under Airport Authority of India. After Appling online candidates will be selected on the basis of various round of Selection. The major rounds of selection are: “ Written Exam (Computer Based Test), physical measurement, driving test and physical endurance test”. Those who cleared all these round of selection will be recruited for these job profiles. 5TH Nov. 2018 is the Opening Date. 5th Dec. 2018 is the Last date To Apply.